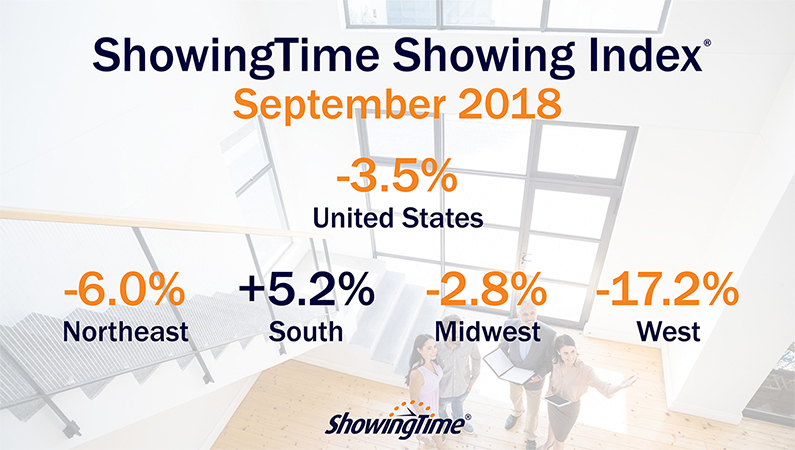 Oct. 24, 2018 – The ShowingTime Showing Index® revealed today that homebuyer demand remains high throughout much of the country despite showing activity leveling off from last year’s record numbers. The September 2018 U.S. Index exhibited a 3.5 percent year-over-year decrease in showing traffic, the second consecutive month the national index has decreased from last year’s historic heights. September showing activity also decreased year-over-year in the Northeast (-6.0) and Midwest (-2.8 percent) regions, marking the fifth straight month of declining showing traffic in the Northeast and second straight in the Midwest. The West Region, which has experienced high prices and tight inventory for much of the year, decreased 17.2 percent year-over-year. September is the eighth consecutive month the region has exhibited year-over-year declines. The South Region continued to experience an increase in showing activity despite Hurricane Florence hitting land on Sept. 14, exhibiting a 5.4 percent year-over-year increase. That increase is due to showing traffic decreasing following Hurricane Irma in September 2017. To view the full report, visit showingtime.com/showingtime-showing-index/.